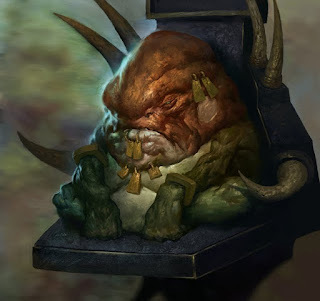 Slann are large, corpulent toad-like beings. A Slann's bloated body can take a fair beating, and their magical energies lend them some protection, however overall they are physically frail. When in battle, Slann do not walk or ride beasts but are instead born aloft on floating palanquins imbued with magical power. This is partly to avoid setting foot on the ground which has been tainted ever since the first Coming of Chaos. Slann are essentially immortal and have never been known to die from old age. However none have been spawned since the fall of the Old Ones. As a result the Slann are a dying race, unable to replenish their numbers. Each time a Slann dies it is a great loss for the Lizardmen. Due to their great age, even the youngest Slann are many thousands of years old and can remember a time long before the rise of Elves or Humans. They regard the world with a cold, alien intelligence. The Slann are, on average, the most powerful wizards in the Warhammer world, capable of killing a foe with a wave of their hand or destroying a city with but a nod of their heads. Even the lowliest Slann is more than a match for the greatest wizards of other races. Only the most powerful of Elf mages can compare. Escalation Die of 2-3: 20 additional damage. Escalation Die of 4-5: Target is weakened. Escalation Die of 6: 40 additional damage. Natural Even Roll: Target is stunned. Immortal Ruler: When the escalation die is at 1, the Slann summons 1d6 skinks. When the escalation die is at 2, the Slann summons 1d3 kroxigors.